People love lists. Lately, I’ve seen lists for 7 Ways to Look Younger, Worst Dressed at the Grammys, and our favorite, Top 5 Facebook Software Pages. 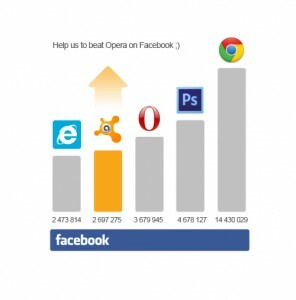 Late last year, as the number of fans on our popular Facebook page increased, Julia, my fellow Queen of the avast! FREEks, and I noticed that we were quickly gaining on a very famous name in the software category. This software royalty has been around for decades. No matter what you think of it now, it’s a cornerstone of just about everyone’s internet experience, so we watched with astonished glee as our number of supporters and fans edged closer to their number. In December, our awesome avast! Community overtook …you ready for it? 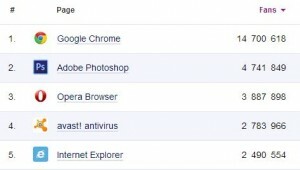 Internet Explorer! We felt like Lady Gaga taking the First Lady of Pop crown from Madonna! So if you already have a Facebook profile, please like our avast! Facebook page. When you see how much fun we have there (and there is some fun planned for the launch of avast! 8), I hope you will share avast! with your friends too.